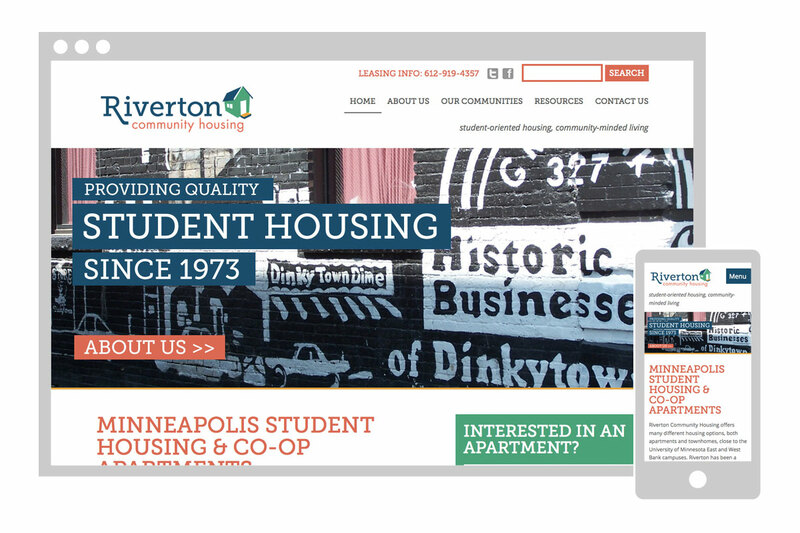 Partnering with Clearspace Creative, I helped Riverton Community Housing, a Minneapolis Student Housing Co-Op, rebrand themselves to better connect with students. I designed a logo with bold, fun colors that would be easily identifiable as new students search for a place to live. I provided them with a brand manual and also designed their annual report to introduce their new, fresh face. I designed and built the website for Riverton Community Housing to be helpful for students looking for housing and hub for current residents. The site features information about the different housing options available, photographs, resident news and a blog. I used a content management system to make sure that they can keep the site up to date themselves without needing me to write new code for every change.